Socialisation is the process whereby a puppy learns how to develop positive relationships with the other animals in its world. The most sensitive period for successful socialisation is during the first few months of life. 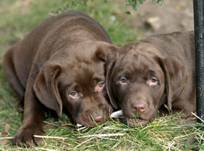 At this time puppies are inclined to explore and show a positive interest in new stimuli. Exposure to a variety of people and other animals is an essential part of developing good social skills. Beyond about 4-5 months of age, the fear response overtakes the exploratory instinct, and new stimuli are met with more caution. By providing your puppy with frequent, positive social experiences (with people, dogs and other pets) during the early months, you will reduce his chances of developing antisocial behaviour and fear that may lead to aggression. Puppies learn extremely rapidly, and any early negative experiences can have a profound effect on behaviour, so take care to avoid any frightening experiences in the early months. Attending puppy classes during the first few months of life is an excellent way to ensure multiple enjoyable contacts with a variety of people and other dogs. Classes should be run by a qualified professional, and interactions between the puppies must be carefully supervised to ensure that the interactions are pleasant and no bad habits are learned. Classes should therefore not be too large! You should expect puppies to be allowed to interact in pairs or threes, but “free-for-alls” are not advisable as games can quickly become out of control, leading to anxiety, aggression, bullying and the learning of bad manners. You should take your puppy to public places at every opportunity and let him meet a variety of dogs. Dogs come in all shapes and sizes, and have different personalities. Some are shy, some are outgoing, some like to play chasing games, some like to wrestle, some like to play tug, and some prefer not to play at all. Your puppy has to learn how to greet and respond to all types of dog, and to adapt his play style to the other dog – this can only come with practice. In the park, allow your puppy to meet other dogs, provided the other dog’s owner gives permission. Encourage your puppy to greet the other dog quietly and fairly calmly, with four feet on the floor! You are looking for relaxed, loose body language, with a waving tail – these are friendly signals. The dogs will approach and sniff each other (bottoms and faces) and may then decide to play, in which case you will see some bouncing and perhaps a play bow (bent elbows and bottom in the air) – these are play signals. Alternatively the dogs may decide not to interact further, and simply go on their way. Ensure that your puppy’s experiences with dogs and other animals are positive and non-punishing. Avoid dogs that are over-boisterous or aggressive as they may scare or hurt your puppy. As a general rule, both dogs should be on the lead or off the lead. If one is free and the other is not, the on-lead dog can feel trapped and anxious. Try to prevent bullying – if the dogs are playing a chasing game, and one dog is persistently chasing the other, check that the chased dog is happy by briefly restraining the chaser. If the other dog moves off, it is probably relieved to be rescued. If it approaches and jumps around the other dog it is inviting another game and was quite happy to be pursued! Likewise, if a wrestling game seems one-sided, intervene briefly to give the dogs a little choice about whether the game should continue. Anxious dogs will show some of the following signals: crouched/hunched posture, averted face, wide eyes with the whites showing, tail tucked underneath, ears pulled back, closed or tense mouth. They might seek to escape an encounter. If increasingly worried they might growl, bare their teeth or snap. If either of the dogs in the interaction shows these signs, you should separate them. Aggressive dogs will stand with a stiff, erect posture, stare hard at your puppy, and bark or growl. You must avoid these dogs so that your puppy does not suffer a frightening experience. You should allow your puppy to meet a wide variety of people during his early months. Consider the features that may make some people look different or unusual such as sunglasses, facial hair, hats, walking sticks, pushchairs, carrier bags and hi-vis clothing, and try to ensure that your puppy meets people of all sorts. Carry small treats everywhere with you, so that you can ask each person who meets your puppy to give him a treat. This will teach the puppy to look forward to meeting people and help to prevent hand-shyness, since he will associate new people and an outstretched hand with something positive. Once your puppy will sit, people should ask him to sit before giving the treat. This teaches a polite greeting and will make him less likely to jump up. Don’t forget to give the puppy plenty of opportunities to learn about children. Children walk, act, and talk differently from adults, so to a dog they can seem like a species of their own! Puppies that grow up without meeting children when they are young may never feel comfortable around them. Avoid physical punishment and any interactions with people that might make the puppy anxious. Punishing a young puppy will damage your bond and weaken his trust in people. It is also extremely important that your new puppy is exposed to a wide range of new environments and stimuli (e.g. sounds, odours, locations) to reduce fear of the unfamiliar. This encourages puppies to become confident dogs and again helps avoid behaviour problems such as anxiety, destructive behaviour and aggression later in life. Expose your puppy to everyday events and stimuli such as traffic, vacuum cleaners, washing machines, lawnmowers, riding in the car, football matches, etc. Ensure that these experiences are positive and enjoyable and not too intense for your puppy. If he shows a mild startle response, show him there is nothing to worry about by being calm and matter-of-fact about the stimulus. If he is anxious or afraid, end the encounter immediately, and try again later with a lower-intensity version of the stimulus. Your puppy should also be “introduced” to other domestic animals. During these introductions have the puppy on a lead to prevent chasing, and allow the other animal the opportunity to escape or hide if it chooses. Reward your puppy while he is calm and quiet, and end the encounter if he barks or is over-excited: try again later when he is a little calmer.